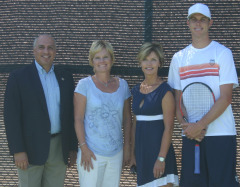 Sandy Foley and Sam Querrey Family Win Darling Center Contract! The Las Vegas City Council awarded a contract to CJMS Tennis Management Company to operate the Amanda and Stacy Darling Tennis Center. The Darling Tennis Center is one of the finest public tennis venues in the country, but due to the economy, the city was considering closing it to save money. This agreement allows the center to stay open. "We are extremely pleased with the efforts of Mayor Goodman, Councilman Stavros Anthony and the city council for doing everything possible to keep the Darling Center a world class facility," said USTA-Nevada Executive Director Ryan Wolfington. The principals in CJMS Tennis Management have a Nevada tennis pedigree. The company consists of members of the Querrey and Foley families. One of the partners is Sam Querrey, a current star in men's professional tennis and a member of the U.S. Davis Cup Team. The Foleys, Jeff and Sandy, have been associated with Nevada tennis for a number of years and Sandy had a large part in getting the Darling Center built. "I am extremely pleased that Sandy is there, she has done such a great job at the facility, and in my mind was irreplaceable. I am so happy it worked out this way," said Fred Darling who was part of making the center possible years ago with a personal donation to honor his children. "With such a great tennis family like the Querrey's who have ties to Las Vegas and to international tennis competition how could the city be luckier? It is great!" The new management team will start operating the facility September, 1 2010 and will kick off this new venture with a free clinic for one hour with touring pro Sam Querrey tomorrow Friday, August 20th at 9am. "My wife Chris and I are excited because it gives us a chance to continue to promote and give back to tennis which has been so good to our family," said Mike Querrey. This team will include many if not all of the existing personnel explains Foley. "We want to keep the family atmosphere that we have built the last 5 years," she explained. "I am so excited to be back, and to be working with the Querrey's to serve the tennis community through the Darling Center. This place means a lot to me and a lot to our community." City Councilman Steve Wolfson commented when the new agreement was approved how many letters of support came in for Sandy, and he congratulated her on all she has done for tennis. The Mayor also commented about following Sam Querrey's results on the pro tour ever since he won the Tennis Channel Open tournament two years ago. "I first started playing tennis in Las Vegas at Green Valley Athletic Club with Jeff Foley, then later won my first ATP tour title here and now I'm excited to pop in to help the juniors and the USTA Regional Training Center when I'm in town.," said Sam Querrey who is now ranked 20 in the world and considered one of America's rising professional tennis stars. A competitive Request for Proposal process was conducted to solicit proposals from qualified companies to operate and manage the Darling Tennis Center, which is located on Bureau of Land Management land subject to the Recreation and Public Purposes Act. A number of companies applied, and according to the city RFP evaluation team they determined that CJMS Tennis Management Company submitted the proposal most advantageous to the city. "Mike Querrey is a well known and very successful businessman in Las Vegas and will bring a great deal to our tennis community," said Wolfington. "Sandy has one of the best tennis minds in the country and has been running the facility since it opened. Add Sam Querrey one of the best tennis players in the world, and his mother who has worn many hats in tennis and you have an extraordinary team." Entering into this public/private partnership is estimated to save the city more than $200,000 annually. This comes at a time when the city is facing a significant budget shortfall of about $47 million. "This type of creative thinking is essential in this poor economy to keep city facilities and amenities open," said Las Vegas Ward 4 Councilman Stavros S. Anthony, who represents this area. "The agreement gives residents and tennis enthusiasts the best of both worlds. The city retains its ownership of the facility, but is able to have a private company operate it in the most efficient way possible. This is a win- win for everyone." The Amanda and Stacy Darling Memorial Tennis Center, the largest of its kind in the state of Nevada, consists of 23 tennis courts including one main court with stadium seating for approximately 2,800 spectators. It also includes a small pro shop, locker rooms and office space. The tennis center is part of the Charlie Kellogg and Joe Zaher Sports Complex. 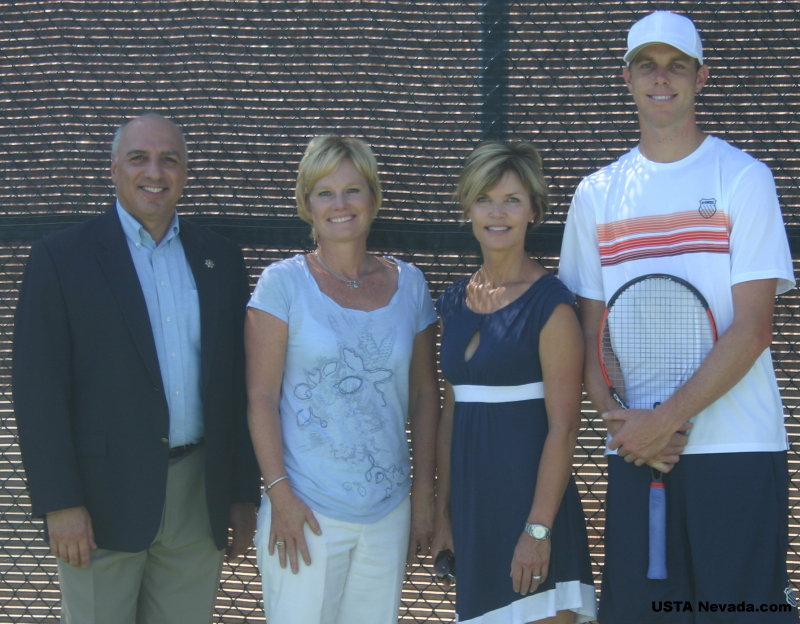 "Sandy and the Querrey's are going to take the Darling Tennis Center to a whole new level," said USTA-Nevada President Tim Blenkiron. "This is a great time in the Las Vegas Tennis community."